We are pleased to offer an embossing service on most of our products. You can add your initials to create a truly unique gift that will be cherished for years. We ask that you allow an additional 1 day for personalisation of any leather products, however every order is dealt with promptly and we can usually complete within the same day. 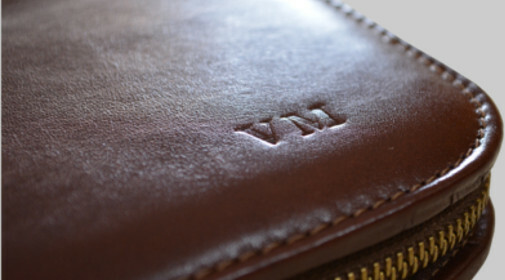 We will emboss up to 3 initials in the bottom right corner of the desk pad, desk set or wallet. Any specific requirements should be discussed with our Customer Service Team prior to placing an order. Please make sure you check all spelling, grammar and punctuation as we cannot accept returns of products that have been personalised.